One of the projects under way at our house this spring is the building of the 5-year-old's herb garden. We've taken big brother's soccer goal, turned it on its side and made a nice tent frame for a plastic greenhouse. Under that plastic, there are about 200 sorrel seedlings, some borage, chervil, a slew of chives ... and a host of other sprouts, half of which she can't identify because she pulled up the stakes we'd put down to take them inside to show her daddy what she'd planted. Anyway, the small herb bed will be devoted mostly to annuals. Cilantro has already produced some fine Cuban dishes, and it will be joined by other herbs as soon as I'm convinced the danger of frost has passed. What's been of most interest to her is the cache of perennial herbs growing on our rocky hillside garden. This is a project some 15 years in the making -- largely neglected for the last eight, because it's hard to raise small children and do intensive gardening. It's a "nature" inspired garden (code for I didn't want to do a lot of work, so it's pretty freeform), and part of it has some perennial herbs that love the steep, rocky terrain so common in Med areas. There's a rosemary (right) that's easily 14 years old. It's put out so many seedlings that have layered to the ground, it's formed a hedge. I've got oregano that has spread to cover a patch the size of Connecticut. 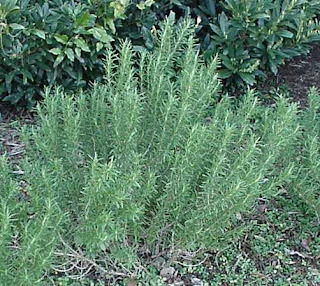 I've found that these Med herbs don't like attention, beyond cutting to use in the kitchen. Fertilize them and they pout. Water them too much, they'll threaten to rot and die. Some plants thrive in rocky soil. We've got a trio of lavender plants (top photo) that produce beautiful flowers and resent any attempts to improve their soil or growing conditions. Marjoram (sweeter than oregano, but often interchanged in recipes), oregano, parsley, sage and thyme also prefer stony settings. Their ideal bed (as I've accidentally discovered) is a stone-strewn slope that lets them put down deep roots to absorb water, yet it keeps their bases high and dry. To build a Mediterranean mound, mark off and excavate the area for your new garden bed, setting the soil aside. Remove 4 to 5 inches of soil in a 12-inch-wide path around the perimeter. Dig down 1 foot below the level of the path. (Folks, that's a lot of dirt. This is not a weekend project.) Amend the excavated soil by mixing in a wheelbarrow-full each of grit, rock rubble, and compost. 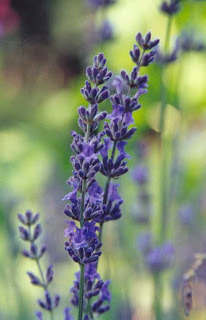 Plant herbs, along with a selection of other Mediterranean plants, putting those that will grown tallest and require good drainage high on the mound and setting low growers that tolerate more moisture lower. Mulch between the plants and around the bed with gravel or organic matter, such as wood chips. Lay the path around the bed with permeable landscaping fabric (to prevent weeds) and several inches of coarse gravel to allow rainwater to penetrate and provide deep-water reserves for the plants.